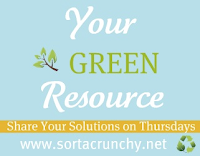 As I've shared before, I love finding green swaps for traditional medications, such as for treating pink eye, diaper rash, seasonal allergies, and baby teething (all of which you can find in the tab up top called, "Green Medicine"). But today I'm talking about gas...baby gas that is. Nothing is more frustrating as a parent than knowing your child is hurting or fussy because of gas, but yet there's nothing you can do about it. I'm lucky that Avery's a little older now and I can usually tell by her talking to me what the problem is. But back when she was younger it was difficult, as she would be crying and even though I could hear the little gas bubbles in her tummy, I didn't know how to get them out. alternative for treating baby gas. Sometimes baby massage, like I shared in this post, helped relieve the gas, but not all the time. That's when I started looking for some type of medicine or supplement that I could give Avery to help ease her discomfort. Below is a picture of Avery one day after a nap when she woke up with some gas. As I was nursing her, she would "toot" and look down at herself like, "What the heck was that?" I would say, "It was a toot....just some gas." As if she understood what I meant, but still, I thought it would at least help to give it a name. Then every time it happened there after, she would stare down, clueless, as to what was going on in her little tummy. That's when I knew it was time to break out some medicine to help, but which kind? More on that in a second. "What was that sound guys?" I think the one brand synonymous with treating baby gas is Mylicon. One of their top selling products is Mylicon Infant Gas Drops. The drops, as stated on their website:"...are the #1 pediatrician-recommended anti-gas medicine, and relieves the discomfort of infant gas frequently caused by air swallowing or by certain formulas or foods. MYLICON® drops are safe enough for even the newest of newborns. They're safe enough to give with every feeding." Let's see how the Mylicon drops rank in "greenness"... by reading the ingredient list (which I found here). Eww, eww, eww! Are you kidding me? Look at all those artificial colors, preservatives, and additives. How could that be safe to give "even the newest of newborns" after every feeding? "Mommy’s Bliss Gripe Water is a safe and effective all natural herbal supplement used to ease gas and stomach discomfort often associated with colic, hiccups and teething. Our gentle and effective liquid formula is Pediatrician Recommended and is the #1 selling natural remedy for colic and gas. EZY Dose Dropper included in every box!" As I said above, I use the gripe water anytime I can hear gas in Avery's tummy, or hear it being released (eww...like how I'm avoiding the word "farting"? I think I'll stick with "releasing," it sounds so much nicer!). I don't have to give her the gripe water very often, maybe once every two weeks or so. Take as needed, up to 6 times in a 24 hour period. By the way, I love the "EZY Dose dropper" that comes with the bottle. It is the best way I've found to give Avery liquid medication! I've even saved a few of the droppers from the past, washed them out, and kept them on hand in case I need to give Avery any type of liquid medicine. for this post when she's older-he he! But I do use the gripe water for other occasions, even if she doesn't have gas, like if she just seems extra fussy and "gripey". Usually I'll try some teething tablets, like I shared in this post, and if she's still fussy (despite being fed and changed), I'll then give her a dropper or two of the gripe water. After a few hours, I'll see how she's doing and possibly follow up with another dropper full just to make sure she's feeling better. Deionized Water, Vegetable Glycerin, Fructose, Sodium Bicarbonate, Citrus Bioflavonoid Extract, Citric Acid, Potassium Sorbate, Organic Zingiber officinale (Ginger Root) Extract, Organic Foeniculum vulgare (Fennel Seed) Extract, Natural Fennel Flavor. I don't know about you, but I love to see actual ingredients I recognize like ginger root, fennel seed, sodium bicaronate (baking soda) and water. Yeah, you passed the green test! Granted, some people may think the baking soda ingredient is debatable, so if you're on the fence, here's baking soda-free gripe water called, "Colic Calm." 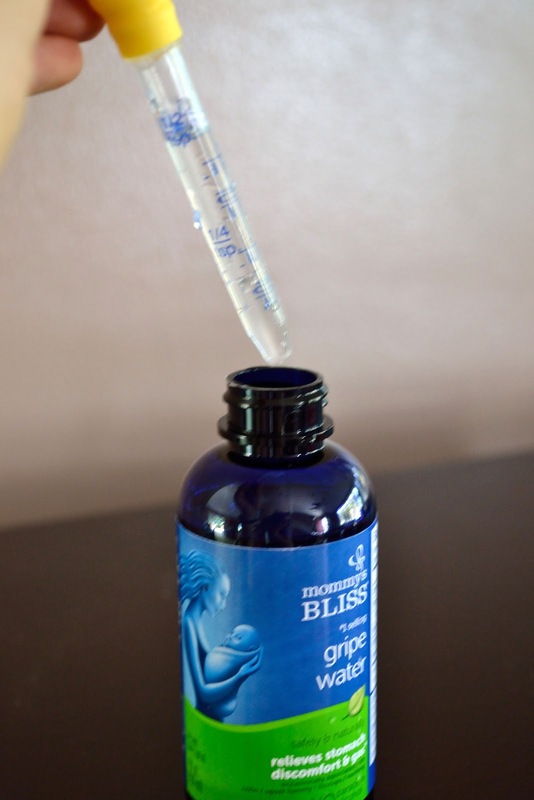 For us, the Mommy's Bliss works great. Another way it's greener is that Mylicon uses a single active ingredient to fight the gas, while Mommy's Bliss gripe water uses a combination of herbs and other natural ingredients to soothe gas pains and stomach discomfort. 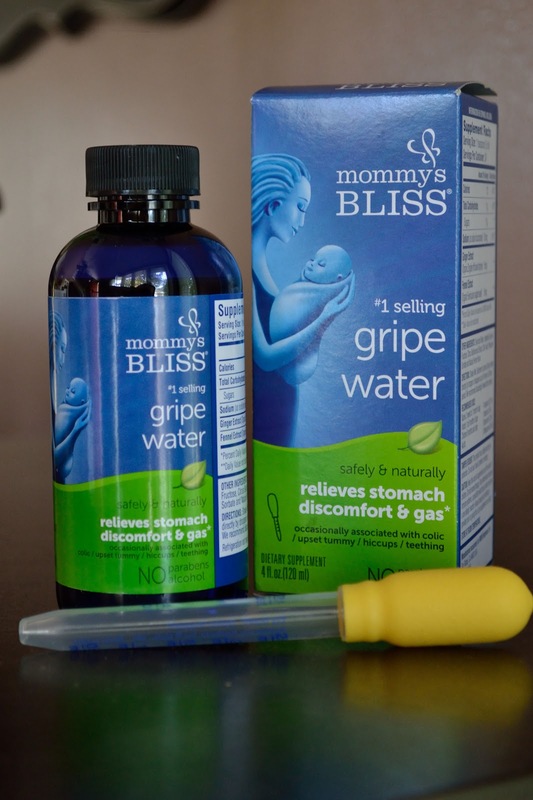 Even better, Mommy's Bliss Gripe Water does not contain any of the following: gluten, starch, dairy products, wheat, yeast, dill, chamomile, alcohol, parabens, artificial colors, artificial flavors, binders, sucrose (table sugar), fillers or petroleum-based by-products, and it is 100% vegetarian & vegan. Just a head's up: Gripe water is not limited just to babies. I read online that it can help adults too, so one time when I had a bloated stomach and need I say...some "releasing" I took about 2 Tbs. of the Gripe Water. The result...it really did help make me feel better, just as it does with Avery. Gotta love sharing green and natural meds with my baby! All smiles now that the gas is gone. I get mine from Wal-Mart where it only costs $7-8. You can also find it online at Amazon.com. The bottle linked to Amazon costs about $9, but they also have a 2 pack that only costs $15, which you can find here. 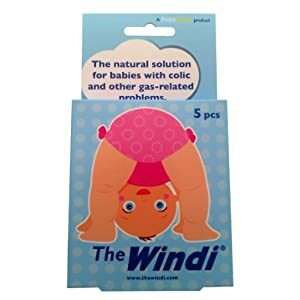 The Windi ($15): a soft tube that you insert, you know where, and help the baby release their gas without any drugs or medication. Happy Tummi Natural Colic Relief Waistband ($15) A fabric waistband with herbal pouch that gets heated for 15-20 seconds to activate the herbs and release the healing stomach properties. So that's how we've gone green with our baby gas medicine. 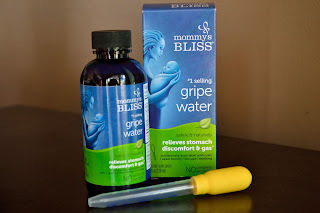 Have you ever tried using a "gripe water" for digestive discomfort for your baby or even yourself? Or do you have any other tricks or tips that you've found helpful for relieving baby gas? Share below. See you next time for another peek inside my "green" medicine cabinet. My disclaimer- I am not a medical doctor or a pharmacist. So while I can share what has worked with me, it may not work for you. I would say to talk with your "health care provider" but they will probably just tell you to take the traditional over-the-counter or prescription medication. Instead you could do your own research or talk with someone at a natural health food store. Hey! Look at all of her hair, she's BEAUTIFUL! I haven't read in awhile, for obvious reasons, but was catching up and saw this post. 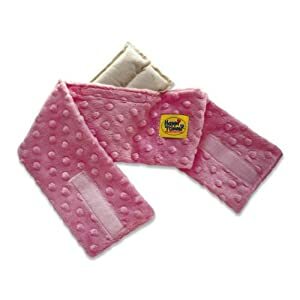 Did you use this stuff at all when she was a tiny baby? I heard it helps with reflux too and was wondering if I should try it with Lemon. Or do you have any other suggestions? Thanks! I haven't been able to get to a store but i read that a lil baking soda n water can help witg gas, Do u think this is safe?